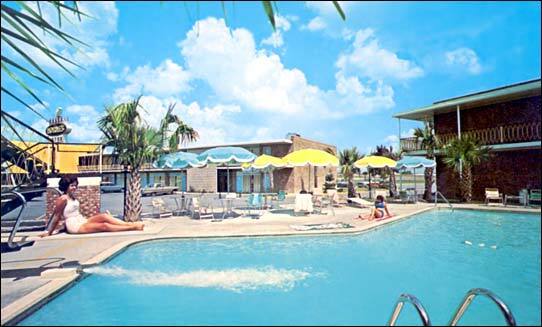 Believed to have been built in 1963 with 98 rooms, Augusta had grown by 1970 to offer 143. 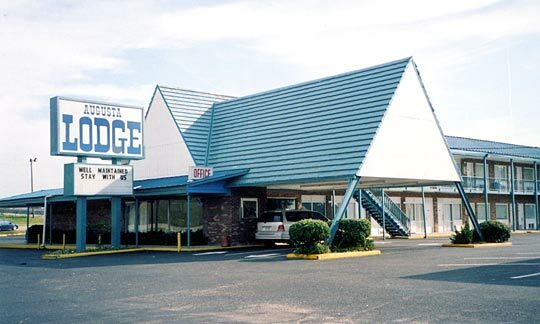 Brilliantly sited at an intersection and in a sweeping curve of the highway, the highly visible property boasted soundproof rooms, swimming pool, Crown Room Restaurant, Grill Room, Cocktail Lounge, Gift Shop, room service, and 10 channel color TV. 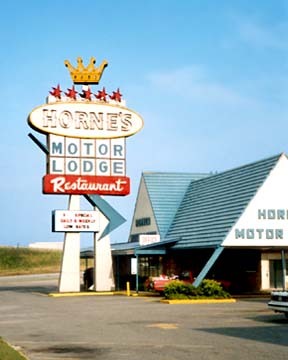 Beset by a series of fires, Augusta's Horne's Restaurant was destroyed in 1982 and then a fire in 1991 burned down one of the guest buildings. Finally a fire in 1997 destroyed 20 units and damaged many others. 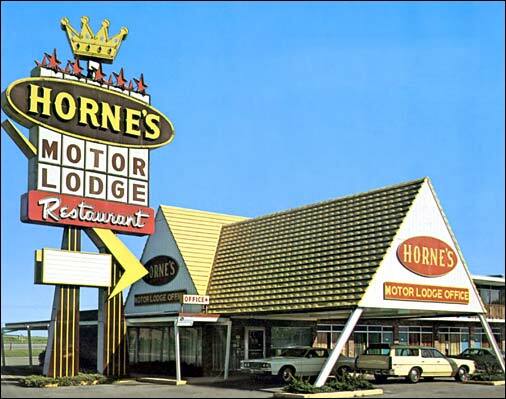 Left: The Augusta site featured the last, towering larger than life, neon Horne's Motor Lodge and Restaurant highway sign. 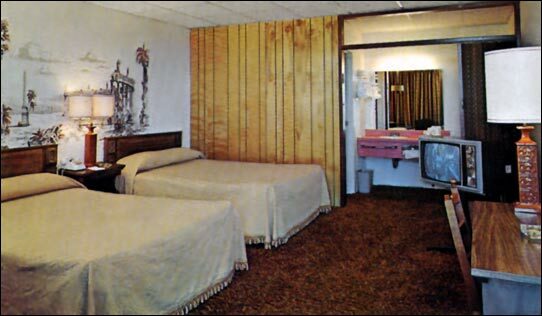 Above: Typical standardized guest room which borrowed heavily from generic yet practical and predictable designs inspired by Holiday Inn which were embraced by most roadside lodging outfits. 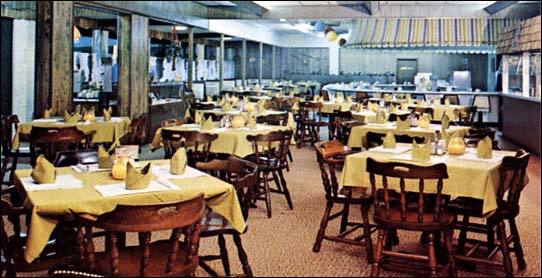 Below: Interior of the Horne's Restaurant showing the Circus Grille in the background. 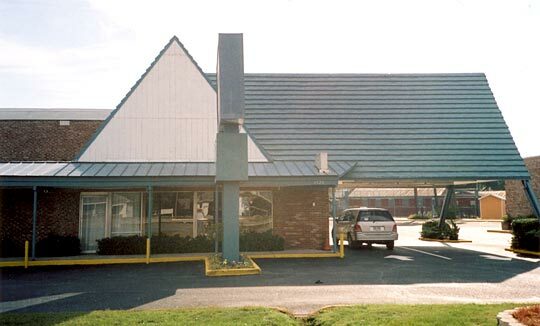 Owned by a Mr. Koellner from April of 1995 until the spring of 1999, the Horne's had reportedly become a den of prostitutes and drug pushers. 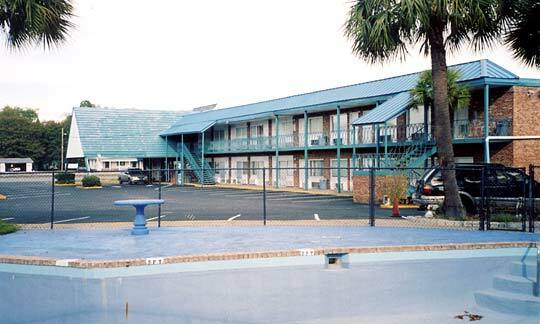 The facility was purchased in 1999 by Terry Anthony's Lodge Resources based in Atlanta. His outfit set about to renovate and make the place respectable once again. 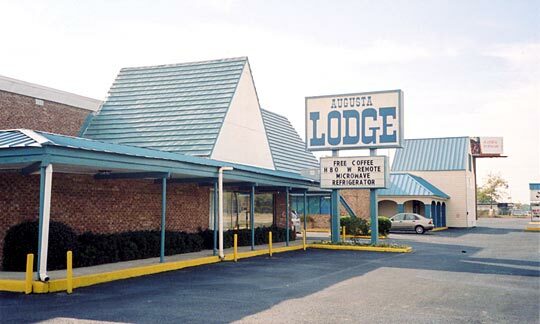 Unfortunately the terrific and very last Horne's Motor Lodge towering neon highway sign known to have existed was removed and replaced with an uninspired plastic backlit sign advertising the property's unexciting new name--Augusta Lodge.